Is Iranian power on the rise? As the Iranian nuclear talks neared preliminary agreement, and as the Houthis drove into southern Yemen, world leaders and commentators warned that Iran is on the rise in the Middle East. This, they continued, had to be stopped by imposing tougher sanctions and opposing the Houthis, perhaps through US armed force. Former UN ambassador John Bolton recently called for a bombing offensive on Iran. It was learned after the Cold War that leaders and security bureaus on both sides were given to overstating the other’s power. Such misperceptions are practically endemic to the intelligence and foreign policy processes and it might be asked if this is the case with Iran today. A hostile Sunni government was gone, eventually replaced by a friendly Shia one which ended the threat of invasion from Iraq. Iranian security interests increased – less from Tehran’s actions than from Washington’s. Iranian influence rose but never predominated. Shia Iraqis did not want to become a client of “Persia” – an ethnic and geopolitical rival for many centuries – and have the oil wealth to avoid financial dependence on anyone. The Shia government in Baghdad opted to balance off Iran and the US, benefiting from both, avoiding reliance on either. Baghdad allocated significant licenses to American oil companies, purchased an array of American arms, and retained American trainers for its new military. Disappointment in Iran was undoubtedly keen. In recent months, Shia militias have been important in battling ISIL, adding quantity to the weak Iraqi forces. The presence of Iranian advisers has led to the suspicion, if not the certainty, that the militias are a fifth column that will one day deliver Iraq into Iran’s hands. It would be more accurate to say that Shiism forms the basis for cooperation, not alignment or subsumption. Militias have benefited from IRGC advisers but they are more closely tied to mullahs and elders of the urban areas they are drawn from, who in turn are integrated into national politics. As al Qaeda began to reassert itself in western Iraq in the last few years, Baghdad continued to balance off the US and Iran by requesting the deployment of US intelligence teams. When the Islamic State swept into northern and central Iraq last summer, Baghdad called for American airpower and additional training cadres. Today, Iraq continues to balance off the US and Iran. The rival powers are on the same side in the fight against ISIL in Iraq. Each has trainers and advisers, each delivers airstrikes, and each diligently avoids the appearance of cooperating with the other. The Kurdish region in northern Iraq fell out of Baghdad’s control following the First Gulf War in 1991 when a US and western aircap prevented Saddam’s forces from reentering the area. Following Saddam’s fall, Kurdistan became an autonomous region, beholden to the US, with ambitions of full independence. This presents a problem for Iran, though perhaps a manageable one. Landlocked but blessed with oil reserves and geopolitical significance, Kurdistan is being courted by several powers. Israel and the US supported the Kurds against Iraq in the Saddam Hussein years and enjoy warm relations with the newly-forming country. Israel would dearly love to have Kurdistan as an ally in the region, especially against Iran. Tehran, however, has its attractions. It too backed the Kurds against Saddam. More recently Tehran has offered to allow Kurdish oil to be trucked into its pipeline system, providing an alternative to the potentially problematic Turkish route and the ever problematic Iraqi one. Iranian advisers and airpower have played important roles in helping the Kurds driving ISIL from their lands. The Kurds treat evenly with the US and Iran and will almost certainly continue a policy of adroitly balancing them off against each other, denying either side the upper hand and negotiating benefits for Kurdistan. For many decades, since the British established influence in the Mesopotamian region after 1918, Sunnis dominated Iraq’s army and state, despite being only about eighteen percent of the population. Saddam’s ouster brought a sixty-percent Shia majority to power; Sunnis receded to marginality, and western Iraq bristled with sectarian resentment. Today, much of western Iraq is in the hands of ISIL – a group with a measure of support from indigenous Sunni Iraqis, most importantly members of Saddam’s Baath Party and officer corps. Western Iraq today forms a barrier to Iranian communication lines with Syrian and Lebanese allies, both of which are checked by Sunni adversaries. Longer term, western Iraq poses the possibility of a new Sunni region or state – one aligned decidedly against Iran. Though Kurdish peshmergas, Iraqi regular troops, and Shia militias have been retaking territory from ISIL, the deeper they push into western Iraq, the more opposition they will face from indigenous Sunnis who will resent their presence and see a chance to break away from Baghdad, much as the Kurds already have. In this endeavor, they will find considerable foreign support, as shall be seen. Syria and Iran have longstanding ties based on common hostility to Saddam Hussein and wariness of Sunni preeminence in the region. Syria, however, is no longer a coherent state and is unlikely to become one again. Tehran’s strategic ally is now a financial drain. The civil war has fragmented the country into a Shia-Alawi region stretching from Damascus to the Mediterranean coast and into scores of quasi-statelets run by warlords, militias, and self-proclaimed emirs. Many of the statelets are backed by foreign powers, including the Muslim Brotherhood and Qatar, Saudi Arabia, the US, and Israel. This will ensure Syria’s fragmentation for years to come. Iran has been sinking resources into holding up the Assad government and the rump state it still controls. 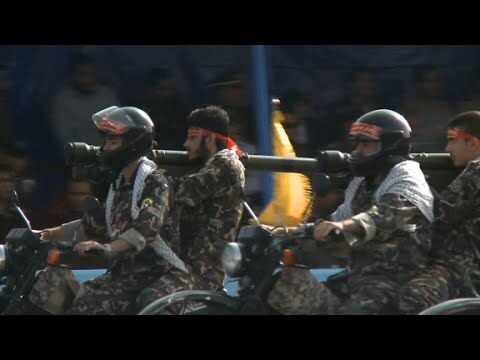 Iranian Revolutionary Guard troops have played important roles in training and leading local militias and giving tactical advice to regular army units. Nonetheless, eastern Syria is out of Damascus’s control and posing a longterm problem for Iran. Eastern Syria and western Iraq are both Sunni regions that are no longer under their respective Shia capital’s control – and Sunni powers will strive to keep it that way. A Sunni autonomous region or state straddling the Syrian-Iraqi border would permanently break the lines of communication of the “Shia crescent” stretching from Lebanon to Iran. The Saudis and their allies will make the creation of this Sunni state a cornerstone of their foreign policy. The Arab Spring seemed to doom old regimes across the region. This opened opportunities for Iran to gain influence in the Arab world at the expense of Saudi Arabia. The key instrument of Tehran’s ambitions was the Muslim Brotherhood – the international league of political parties with large numbers of disciplined followers in many Arab countries, above ground or not. The Brotherhood opposes secular dictators such as Egypt’s Mubarak and monarchies such as the House of Saud. Its agenda in weakening and deposing the old regimes meshes well with Tehran’s ambitions of undermining Saudi hegemony in the region. In this respect, Iran was paralleling Qatar, the small but wealthy Gulf principality that also seeks to avoid Saudi dominance. With Hosni Mubarak out and the Brotherhood’s leader Mohamed Morsi in, a new era had begun – and Iran (and Qatar) seemed to have achieved a great victory. The most populous Arab country, with the most powerful army in the region, was opposed to Saudi Arabia, distancing itself from the US, and at least open to Iranian overtures. The old regime proved to have persistence – and help from Saudi Arabia. Riyadh withheld subsidies and oil shipments which fueled discontent and set the stage for the ouster of the Brotherhood and its ongoing suppression. The old oligarchy is back in power, Saudi subsidies are back, and Egyptian warships are taking part in the Saudi coalition against the Houthis. In recent months, the Houthis, a Shia northern movement, have taken the capital Sanaa and driven south, reaching parts of Aden. The drive, it is claimed, especially in Sunni capitals, has come at Iran’s behest and could not have been done without large quantities of its resources. The evidence of this is scanty, often coming from Sunni intelligence sources and grafting onto an assumption of profound Shia unity. The Houthi offensive likely stems far more from internal politics and resources than from those originating in Tehran. Yemen has never been a coherent state. It has seen two long civil wars between the north and south, which were followed by periods of uneasy unity and feigned comity. The conflict today is due to longstanding regional conflicts, not sectarian ones. A Shia victory would bring little to Iran. Any use of Yemen to attack Saudi resources in cross border raids, or sever shipping lanes, would bring a powerful reaction from western powers, who though less dependent on Gulf hydrocarbons than in decades past, nonetheless do not want further instability in the region or any interruption of global oil supplies. Iranian lines of communication with Yemen would be tenuous at best. Indeed, they may already have been precluded by the Saudi-led air and naval coalition. In that Yemen’s oil and even water are running low, the country would be another money pit for Iran, as it is already for Saudi Arabia, which has supported faltering Sunni factions for several years now. Many states in the Middle East are breaking apart – Libya, Syria, Iraq, and Yemen among them. National boundaries are giving way to regionalism and sectarianism. Iran looks around and asks if it could happen at home; its rivals look around and ask if they can help the process along in Iran. Iran is governed chiefly by Persians who make up sixty percent of the population. (Supreme Leader Khameini, an Azeri, is a notable exception.) However, there are sizable numbers of Kurds and Azeris in the northwest, Arabs in the west, and Balochs in the southeast, who are not pleased with Persian dominance. Israel is thought to be encouraging a Kurdish insurgency, and Saudi Arabia has funded Baloch separatists operating from Pakistan, though Iranian pressure on Islamabad may have ended the program. Aside from ethnic tensions, Iran is beset by a town-country fissure, with urban middle classes wishing for liberalization of state and society, and a traditional rural population that is largely content with theocracy and uneasy with westernization. Internal fissures, ethnic and social, may be assuaged to some extent by the lifting of sanctions. And perhaps this is why Iran’s more adamant opponents, Saudi Arabia and Israel, wish to see sanctions remain in place. The last fifteen years have seen mixed results for Iran, however, on balance, it is difficult to judge it on the rise. The country’s geopolitical situation, and attendant financial strain, may well be significant reasons for Iran’s ongoing dialog with the US. An opening would bring obvious economic benefits but it would bring geopolitical ones as well. The US would be positioned – and disposed – to restrain Sunni hostilities toward Iran. The US would also be positioned to counsel against unilateral action by Israel. And strategists in the US, Iran, and Israel will have to ponder if a US-Iranian rapprochement would also lead to less Iranian hostility toward Israel. Brian M Downing is a political-military analyst, and author of The Military Revolution and Political Change and The Paths of Glory: Social Change in America from the Great War to Vietnam. He can be reached at brianmdowning at gmail d o t com.